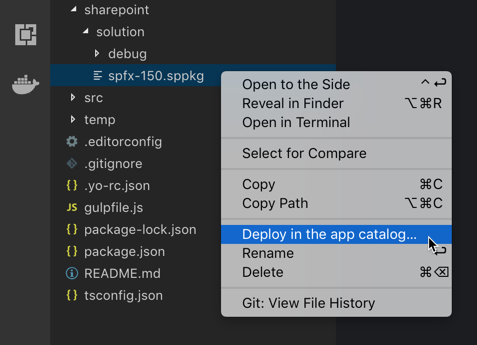 Visual Studio Code>Other>Rencore Deploy SPFx PackageNew to Visual Studio Code? Get it now. Easily deploy a SharePoint Framework solution package to SharePoint Online directly from Visual Studio Code. Choose if you want to deploy the solution in the app catalog or to all sites in your tenant. The extension will automatically upload the selected package to the tenant app catalog. If the package already exists, it will be overwritten. Only solutions that support global deployment, can be deployed globally. Connect to your SharePoint Online tenant, by specifying its URL. You can specify the URL permanently using the rencoreSpfxDeploy.sharePointUrl setting. When this setting is specified, you won't be prompted for the SharePoint URL. When connecting to your tenant, the extension uses OAuth and doesn't have access to your credentials. It can only access your tenant after you granted it permissions and signed in with your account. At any time you can revoke the extension's permissions through Azure AD applications settings. At any time, check the status of your connection to SharePoint.